The Psilocybe cubensis Ecuador is one of the most popular species. Place of origin is the Ecuadorian Andean region, situated at 1000 metres altitude. This strain is considered to be one of the most powerful and largest of all cubensis varieties. The Ecuador usually produces large mushrooms with a long and sturdy stem. That makes it easy to distinguish the Ecuador from other varieties. The Ecuador is easy to grow and yields a large harvest. Ideal, even for beginners. 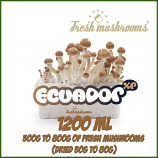 The Ecuador is a popular strain for study by mycologists and biologists. 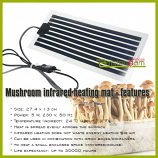 Due to the quality of the mushroom, the active substance content is considerably higher than with traditional grow kits.